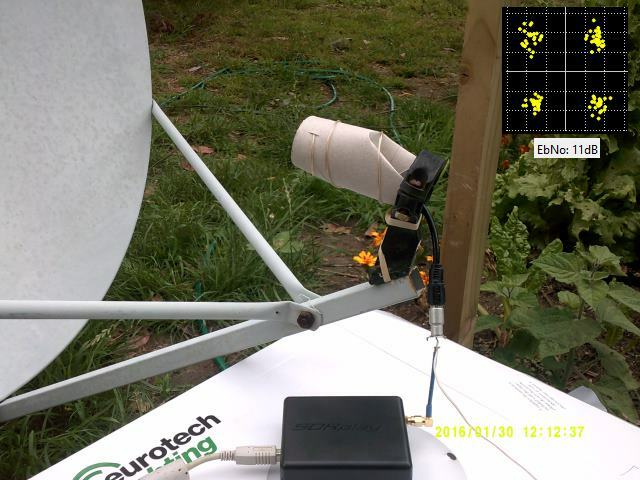 Jonti, the programmer of the JAERO decoder for L-band AERO signals recently bought and received one of our new RTL-SDR Blog dongles and also an SDRplay unit for testing L-band reception. Previously he had been using a standard RTL-SDR dongle. Now he’s done a write up comparing the performance of the three units on L-band AERO reception. You can see the old RTL dongle moves almost 3kHz within a couple minutes after being turned on, this speed is so rapid that JAERO can’t keep up with the frequency changed during this period of time. What’s odd is the old RTL dongle does some fairly crazy stuff around 20 minutes in that lasts for about 15 minutes, JAERO also can’t cope with some of that. The other thing to notice in the old RTL’s spectrograph are vertical lines, these lines I believe are caused by interference entering the dongle between the RTL dongle’s tuner and ADC (analog-to-digital converter). The frequency stability of the new RTL dongle can only be described as amazing!!! There is not much more than 100 Hz change during the whole test. The range of frequencies for the SDRPlay is similar to that of the old RTL dongle of about 3kHz. The difference being the transition from the lowest frequency to the highest frequency is slow. Any demodulator should not have any issue tracking this slow and steady change. The only problem you will encounter here is when you are trying to tune into a particular frequency your frequencies will be slightly different depending on the temperature of the SDRPlay. The results of the frequency stability test on an AERO signal. 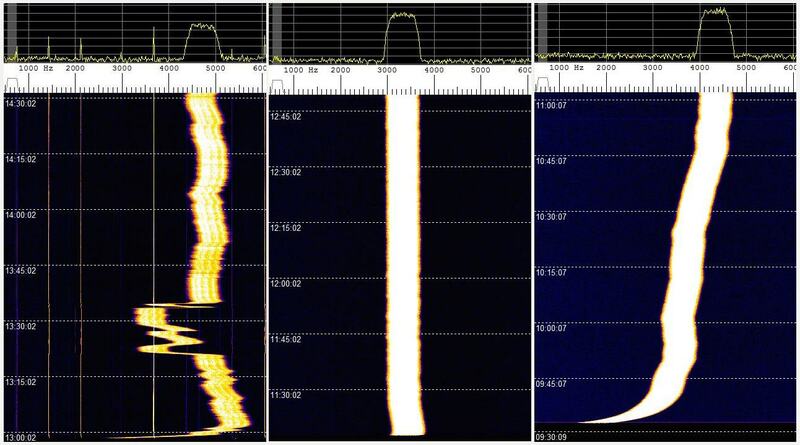 Left: Standard RTL-SDR; Middle: RTL-SDR Blog Unit; Right: SDRplay. Jonti also found that in terms of sensitivity the SDRplay was the best at receiving when a non active antenna (an active antenna is an antenna with a built in LNA) was used. The RTL-SDR dongles could not receive well at all when a non active antenna was used. When an active GPS antenna was used the SDRplay was only about 1dB more sensitive than the RTL-SDR dongles. In his article Jonti expressed concern that the SDRplay did not see much improvement in SNR over the RTL-SDRs when an active antenna was used. Our thoughts on the sensitivity findings are that the SDRplay does not see much improvement with an active antenna because the noise figure of the system is not reduced any further by adding an additional front end LNA (the noise figure in a RF system is almost entirely determined by the first LNA in a RF chain). Adding an extra LNA could even potentially make reception worse by reducing the overall linearity of the system. An external LNA would only be beneficial if a long run of coax was used between the feed and SDR, and in Jonti’s connections he connected the feed and SDRplay with a very short cable. The RTL-SDR only works well with an active antenna because its raw sensitivity at 1.5 GHz isn’t great, and it needs the extra boost from the LNA. Testing the SDRplay with a non-active antenna. At least this is a cheap and easy experiment with the stock dongle too, which might worth to give a try. Very nice piece of work. Just a suggestion; you could use RG/6 coax as a feedline from the helical antenna to the receiver inside the shack. It’ll keep your dongle/SDR receiver inside and safe from the elements. You’d need SMA to F adapters though, and a voltage source to power the active antenna. I’ve done that with a home brew L band antenna and an inexpensive satellite in-line preamp located at the dish when I was tinkering with L band signals from the 15.4W bird. Have not tried receiving AERO though, winter weather is in the way, but thanks for the excellent post, will use it as a guide when trying this out. That home-brewed helical antenna is very ingenious! Used, slightly crushed toilet roll bobbin…and that transmission line. Where is your blog ? You are right, the feed is very poor and opposite pol. lossing at least 20dB. Moreover a peace of can tin reflector may help a lot. He should have at least 25dB Eb/No with the proper antenna instead of 8dB. Very NICE truck by the way! The RTL-8187L is a WiFi transceiver. Used in conjunction with the WiSpy it is a pretty powerful tool. Mostly run under pentesting Linux OS’s. Do I see right or he is using the LHCP polarization (RHCP feed). He is lossing 20dB because of that. Certainly looks like it. I’d say he needs to start over again and repost with up to date info. My little experience with Funcube Pro/R820T/R820T2/E4000 on J-Aero signal. A little clarification. I’m not criticizing Jonti here, I’m just recommending that he retest with the proper antenna polarity. The use of a dish inverts the polarisation of the signal So RHCP signal gets to the LNA as LHCP signal.